When an employee is deleted, they will no longer be able to sign in and will be shown on the”Deleted Employees” page, not on the Employee List. Any past shifts that they were assigned to will show their name with the word (deleted) after it when viewing certain schedule views. 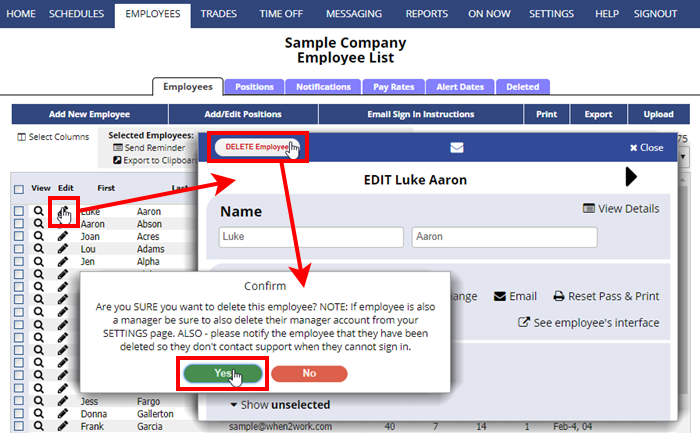 Managers with permission to “Add/Delete Employees” can delete employees by clicking the pencil icon next to the name on the Employee List page and then clicking “Delete” in the upper left. Managers with permission to “Add/Delete Employees” can restore deleted employees from the EMPLOYEES>Deleted Employees page. Past shifts will remain in the schedules, but if you have shifts in the future that were assigned to the employee, they are automatically unassigned from those shifts when they are deleted. When you delete an employee, they are no longer included in the Total Employees count for billing purposes. Information about a deleted employee’s shifts can be viewed on the EMPLOYEES>Deleted Employees page and we maintain that information for you as a courtesy.